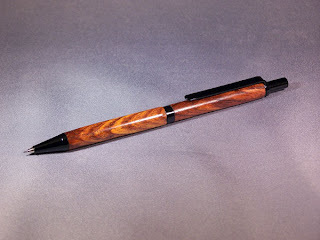 Wood Destruction by a Woodscrub: Better Pic of the Kingwood Pencil and the Shark photo studio! Better Pic of the Kingwood Pencil and the Shark photo studio! Now that I got my lighting back and functional, here's a better pic of the pencil shown in the previous post. I've been asked about how I photograph my projects. When I think of it/am not too lazy/have batteries I use this rig. It's a portable small item studio purchased at WalMart for $50. 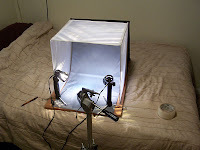 It includes two color corrected incandescent "hot" lights, the tent, blue and gray backgrounds, a little tripod, and a carrying case. I also have a handheld strobe attached to the PC socket in my Kodak Z7590 digicam. The camera is held by a really REALLY old Graflex tripod. In the photo is a roll of shipping tape. I use that as a lint catcher because there's always dust and lint and crap that settles on the background cloth. Adhesive tape is the easiest way to remove it on the spot.